May 2008 be a blessed year for you. We begin it with gratitude and thanks, and a prayer for you and for those you love. January is often a quiet time, after the bustle of the Christmas holiday, but for us at the mission, it’s as busy and hard working a time as ever. Thank you for making our signal possible, as we broadcast the Mass, the Rosary, hours of daily news and information and education, and 34,000 inspirational spots every year into some of the most remote homes in the United States. BLESSING: (left) KNOM spiritual advisor Fr. 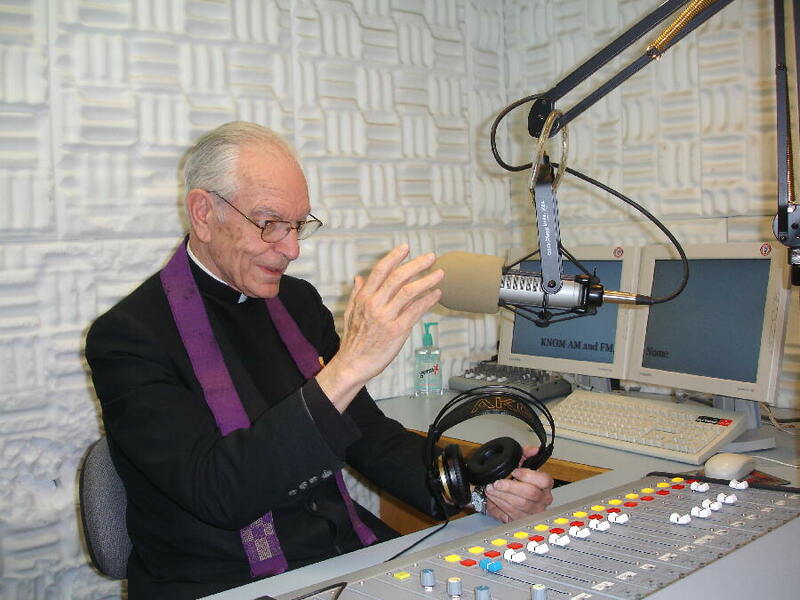 Armand Nigro, SJ, blesses KNOM listeners from Studio C.
Fr. Armand, a retreat director for Holy Spirit Retreat House in Anchorage, has pledged to daily pray for you and your intentions. 11 feet on a side, Studio C is KNOM’s largest, seeing heavy use for interviews, talk and call-in programs. Broadcast news and information as thoroughly, objectively and honestly as possible. Thank you once again for your prayers and your financial support for this mission, , which has become a trusted member of the family for people in far-flung villages across 100,000 square miles of road-less and isolated western Alaska. MIRACLE: In 2006, we thought it a miracle that tiny Sophia Woyte, daughter of KNOM’s Robyn Woyte and husband John, born 28 weeks premature, survived and prospered. We’re delighted to report that Sophia, at 15 months of age, is normal, well and strong. We promise you a photo next month. INSPIRATIONAL SPOT: God does not promise a comfortable journey, only a safe landing. IN CONTROL: (left) Program director Kelly Brabec poses briefly while on the air in Studio A, the mission’s master control. 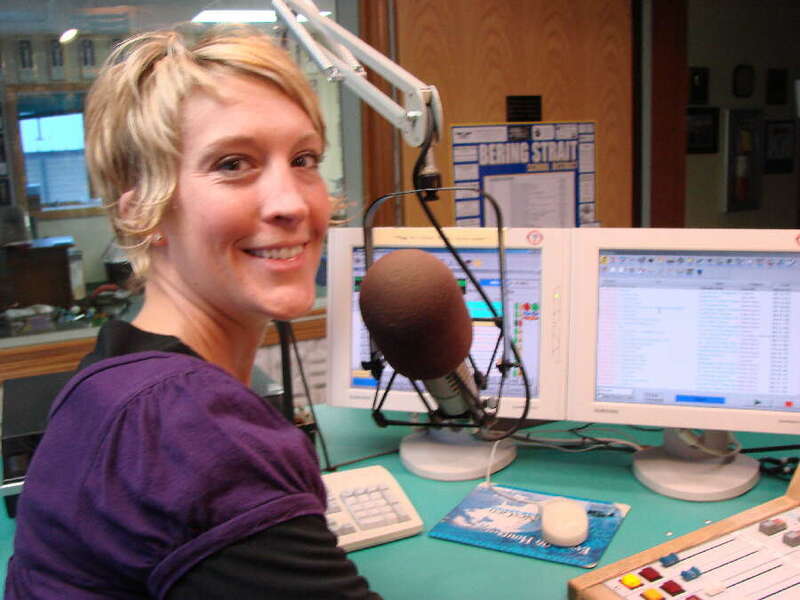 From Fremont, Nebraska, Kelly is in charge of all programming except for news. She was a volunteer from 1998 – 2000, and returned to the station in autumn 2002. She’s a newlywed, just married in October. Can I find your signal on the Internet? At present, the cost of music royalties is prohibitive. We hope to stream our signal some day so that you can listen to it. Why do you keep sending me envelopes? Overall, they more than pay for themselves. Since we’re so small, it’s less expensive for us to mail to everyone in the same way. Does my stamp really help? You bet. We’re happy to provide postage for our benefactors, but if you do add a stamp to the envelope, the Post Office reimburses us for the postage. How much does it cost to send me the Nome Static? $5.43 a year. We are happy to send it to anyone who’s interested, regardless of the ability to give. We do, however, request prayer in return. 97% of KNOM’s income is gifts from individuals like me. What’s the other 3%? Last year, it was mostly program underwriting by businesses, donated air fares and interest on emergency savings. What is “fundraising” in your annual report? Each year, we lose about 15% of our contributors. That’s about average for a Catholic charity. We invite others to join our mission by mailing to rented lists. Our mailings include a letter from general manager Ric Schmidt and a Business Reply envelope. Do you have a question about our mission? We will be happy to answer it. RETREAT! If you are interested in a Jesuit summer retreat in Anchorage, Fr. Armand conducts retreats, with lengths from weekends to 30 days. He welcomes you to call him at Holy Spirit Retreat House, 907-346-2343, extension 215. WHERE THERE’S A WILL: Many of the KNOM past and present staff have included the mission in their wills. For some, it’s the major beneficiary. When remaking your will, we ask that you consider doing the same. We prayerfully place all bequests into funds for major projects, and to protect the mission in times of emergency. May God bless you for your kindness. INSPIRATIONAL SPOT: When troubles drop you to your knees, remember, that’s the perfect position to begin praying. 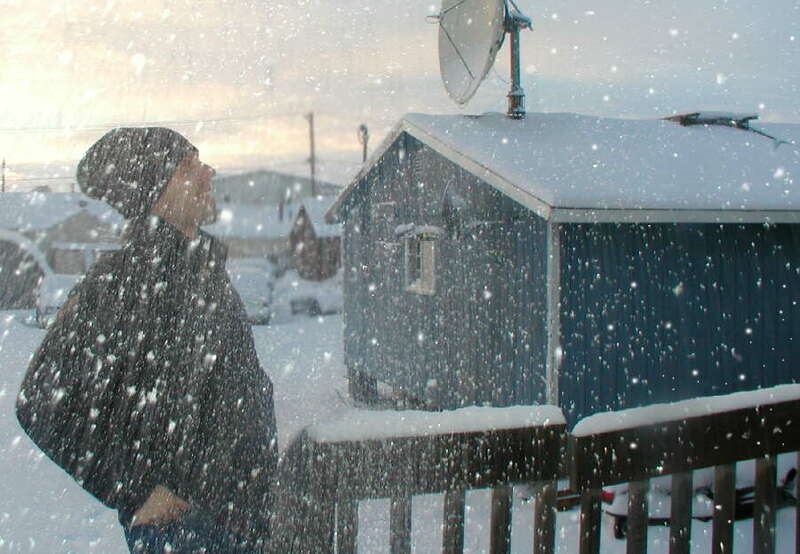 SNOW BUSINESS: (left) KNOM news director Paul Korchin is no stranger to an afternoon snow squall. Paul was a volunteer for the mission between 1987 and 1989. Ten years ago, he returned as news director. Raised in Chicago and Washington, DC, Paul is by far the most educated KNOMer of all time. He holds a Ph.D. in ancient Near Eastern languages from Harvard University. Among his hobbies are teaching night courses at Nome’s University of Alaska campus, and writing scholarly articles. Recently, he completed his first book on Old Canaanite and Biblical Hebrew verb endings. Paul applies tremendous energy and dedication to his work at KNOM, ensuring that throughout our vast coverage area, remote village Alaskans hear fair and balanced reporting about the events and issues that are important to them. THE OLDEST? Yes, we are the oldest Catholic radio station in the United States, on the air July 14, 1971. Our work can be difficult and long, but thanks to your support, our mission may be the most honored radio station in the country. Our work has been recognized by 16 Gabriel “Radio Station of the Year” Awards, 4 Crystal Awards for Excellence and 2 Marconi Religious Station of the Year from the National Association of Broadcasters, and 54 honors from the Alaska Broadcasters Association over the past twenty-one years, including 6 Best Service to the Community Awards. You share in these honors. Please pat yourself on the back! INSPIRATIONAL SPOT: Lord, teach me to admire people without envy; to be able to disagree without bitterness; to fight injustice but without hatred or malice; to cultivate humility without giving up my convictions. I’d like to be able to accomplish my goals in life without being vain. And I want to recognize that my service for others is how You will judge me. INSPIRATIONAL SPOT: God loves each of us as if there were only one of us. THANK YOU FROM THE KNOM CREW: From left, meet office assistant Betsy Brennan, general manager Ric Schmidt, public affairs director Amy Flaherty, volunteer music director Laura Davis, business manager Lynette Schmidt, volunteer production director Kristina Proctor, program director Kelly Brabec, volunteer inspiration director Dave Dodman and volunteer news reporter Jacob Buckenmeyer. 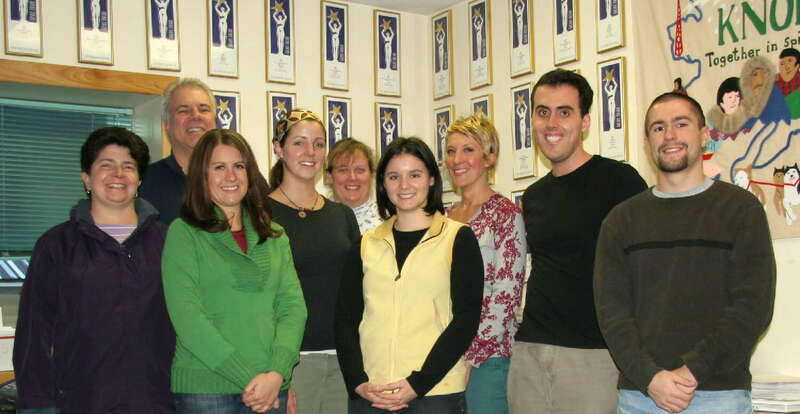 In the background, you can see some of the mission’s many awards. With so much travel, it’s impossible to get everyone together at once. Missing are news director Paul Korchin, office assistant Robyn Woyte, and financial officer Tom Busch. We thank you and we know you would enjoy meeting every one of these fine people. FORTY YEARS AGO: From Anchorage in January 1968, Alaska broadcast pioneer Augie Hiebert reports that the paperwork that would allow the new Catholic station to be built “progresses in a satisfactory manner.” This month, 550 people receive the mimeographed Nome Static and 52 of them contribute. THIRTY YEARS AGO: Timaree Bierle, RN, is one of KNOM’s six support nurses. She works at Nome’s hospital and lives as a volunteer, donating her entire salary to KNOM. 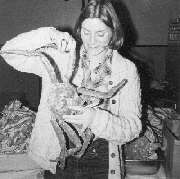 At 2 AM January 17, 1978, she flies on a medical evacuation flight for a patient at Little Diomede Island. The small plane lands on the ocean ice on the Russian side of the International Date Line. It happens to be her birthday. 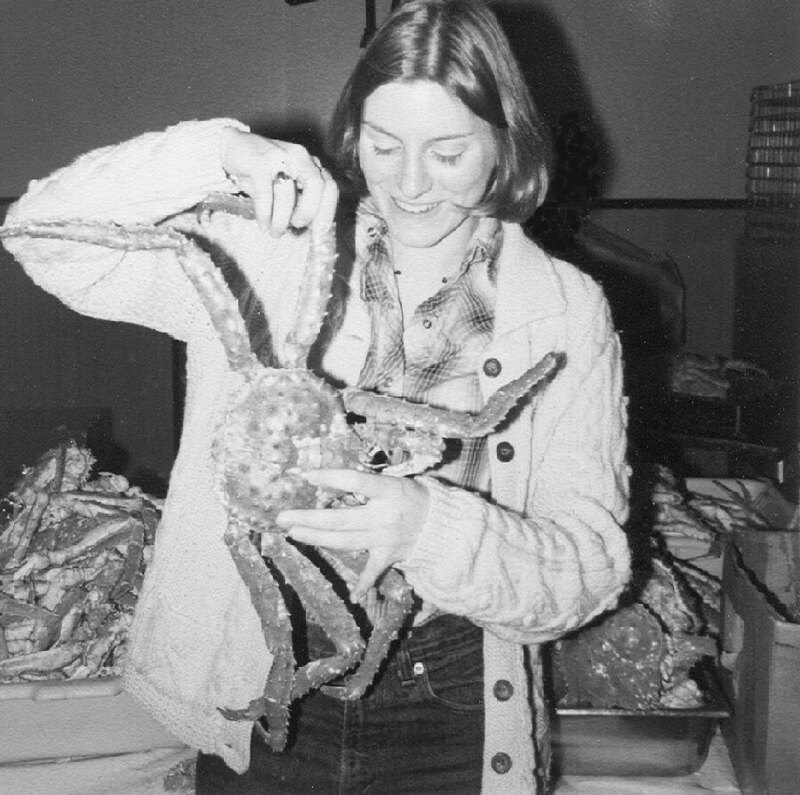 (Left) Timaree Bierle, RN, examines dinner from the Bering Sea. TEN YEARS AGO: In January 1998, KNOM reports a frightening rescue. A snowmobile crashes through the ocean ice, and with horror, office workers watch the driver reach into the water and pick up a bundle – a baby! The assistant district attorney runs downstairs and wades through frigid waist-deep water to carry the baby, so cold he isn’t certain he can hang onto it, and tosses the child about three feet to another rescuer on shore. Thankfully, everyone is okay. YOU AND YOUR INTENTIONS REMAIN IN OUR PRAYERS. Thank you so much for your prayers and your kindness to the distant families whom we serve. Until next time, God bless you! Copyright © 2008 KNOM. All rights reserved.